Sleep Number I-10 Review - Best Mattress For You? Home » Sleep Number I-10 Review – Best Mattress For You? Sleep Number I-10 Review – Best Mattress For You? The I-10 mattress is Sleep Number’s most luxurious model. Its innovative reverse comfort foam layer allows couples to customize their side of the bed exactly how they like it – PlushFit foam or memory foam. Oh, and it’ll keep you sleeping cool all night. Is it right for you? Read on for my full review. The I-10 is one of three mattresses in Sleep Number’s Innovation Series line of beds. The series also includes the I-8 model and I-LE mattresses. The I-10 mattress has a 15” profile, which is measured from the base to the highest loft of the mattress. I-10 mattresses are designed with couples in mind and can only be made with two air chambers. This means that each I-10 mattress will come with Sleep Number’s “DualAir™ adjustability” feature that allows you to n adjust firmness and support on each side of the bed to your Sleep Number setting. The hoses to pump air into the chamber are 4ft in length. Directly below the air chamber(s) is a 2” foam base pad. What sets the I-10 apart from its other Innovation Series mattresses is the 4” reverse foam layer that sits directly above the air chambers. Ergonomic, reversible design lets you individualize your comfort. Conforming memory foam reverses to PlushFit foam featuring seven zones for superior pressure relief and gentle support where you need it most: head, shoulders, lower back, hips, knees, lower legs, and feet. The foam layer comes in two separate pieces (no matter what size you get) so that each person can flip it to their preferred foam side – PlushFit or memory foam. The I-10 mattress is made with a polyester/polypropylene blend fabric that is designed to be soft and breathable (same fabric as the I-8 model). The mattress top also matches the I-8 model. It is a duvet pillow top that includes 2” of Hypersoft Quilting Foam for a plush surface and Outlast temperature balancing technology to minimize temperature swings. It’s worth noting that the Sleep Number Sleep IQ Technology, which will track your sleep and help you find your optimal Sleep Number setting, is included in the price of the I-10 mattress. Optional: You can add a FlexFit Adjustable Base for your bed that will allow you to raise the head and foot of the bed. Sleep IQ Technology is included and FlexFit Adjustable Bases are an option at an additional cost. When it comes to firmness, there are several factors in a Sleep Number bed that will affect how firm your bed is. Your Sleep Number: The dual air chambers in the mattress will inflate/deflate according to your Sleep Number. The higher the Sleep Number, the more air will fill the air chambers and the firmer your mattress will be. Your Comfort Layer: There are several types and thicknesses of foam comfort layers in Sleep Number beds. Denser and thicker comfort layers (like memory foam layers) will provide more support and increase the firmness of your mattress. Your Mattress Top: Sleep Number offers a variety of mattress tops. Plusher pillow top style mattress tops will be less firm than a flatter mattress top. The I-10 is an interesting mattress because it has a comfort layer made up of both memory foam and PlushFit foam. The PlushFit foam is lighter than the memory foam, which tends to be denser and firmer. The Customer Service representative I talked to told me that the memory foam layer in the I-10 makes it a firmer mattress than a popular model like the P-5, which contains only PlushFit foam. You Have A Sleep Partner. The I-10 model is only made with dual air chambers – that means that each individual can control his/her side of the bed with their own air chamber customized to their individual Sleep Number setting. You Want To Be Able To Switch Things Up. Customization is the name of the game with the I-10 mattress. In addition to adjusting your support with your own air chamber, the reverse comfort layer is separated into two pieces. This way, you can decide if you want to sleep on PlushFit foam or memory foam, and your partner can do the same. You Sleep Hot. There is temperature regulating technology built into the mattress top of the I-10 mattress. Outlast Technology (the same kind found in Slumber Cloud’s Dry Line Protector and the I-8 mattress surface) is designed to pull heat away from your body and re-distribute it during the night so you sleep comfortably. You Want A Firm Mattress. The I-10 is made up of several layers, including a 2” foam base pad, 4” of PlushFit foam and memory foam and 2” of Hypersoft Quilting Foam sewn into the duvet style mattress top. While memory foam is a denser foam, so many layers in between the top of the mattress and the air chamber make the mattress naturally less firm than more standard models like the C-2 or C-4. You Are On A Budget. The I-10 mattress is the most expensive Sleep Number bed available. The mattress just under $5,000 for a Queen size. It does include many features, including Sleep IQ Technology. Sleep Number does sell one Queen mattress for less than $1,000 (the C-2 model) and several for under $3,000, including the bestselling P-5 mattress. The I-10 mattress truly is designed with couples in mind. The mattress only comes with dual air chambers, which means that each individual can control the firmness and support of his/her side of the bed. With the reverse comfort foam layer, the individual can also decide if he/she wants to sleep on memory foam or PlushFit foam. In other reviews I read, many customers purchased the I-10 because they were suffering from pain related to injuries or aging. They liked having the ability to not only adjust their firmness and support, but also the benefits of having an Adjustable Base – raising and lowering the head/feet of the bed in addition to other spa-like features. The biggest complaint about the I-10 mattress is the price. The price of a Queen size mattress alone is nearly $5,000. If you decide to go with a bigger mattress like a Split King, and add a FlexFit adjustable base, you could spend significantly more. The most complaints came from the Split King size bed. This sie actually comes as two individual mattresses (as opposed to one mattress with two separate comfort foam layers). People had an especially difficult time getting sheets on/off the Split King because of these two separate mattresses. 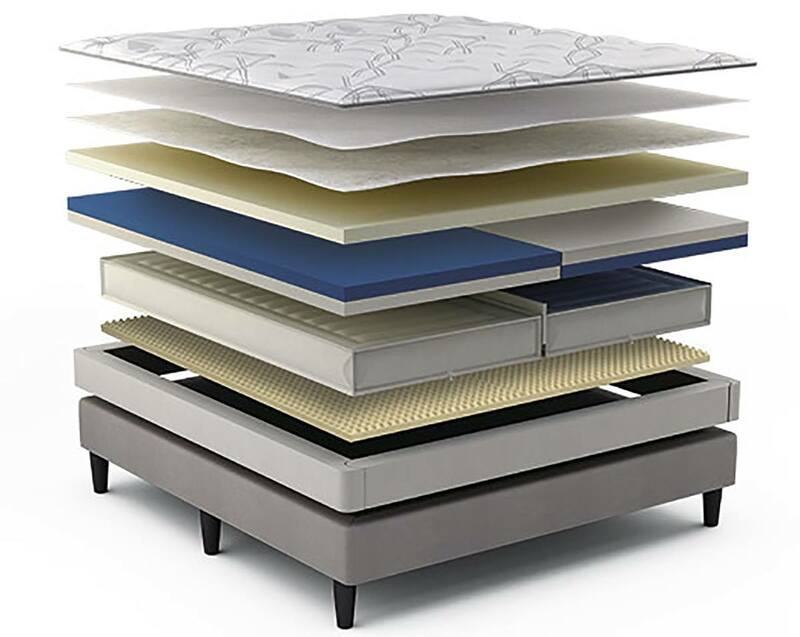 Mattresses like the FlexTop King or Split King – also makes it difficult to find comfort in the center of the mattress. Customers struggled with being able to have more intimate moments with their partner or even just feeling “stuck” in the valley created between the two mattresses. Those who also purchased an Adjustable Base with their Split King said that their mattresses would slide down and bunch at the bottom of the bed when they raised the head of their bed. This was a frequently reported complaint. Those who choose the I-10 mattress over other Sleep Number models are couples (most likely) who want all of the comfort features that Sleep Number offers. The I-10 lets you adjust your level of support and comfort with your Sleep Number setting with its reverse foam comfort layer. You also get the benefits of cooling technology and a soft and breathable duvet-style mattress top. Those who can afford the $5,000+ price tag would pick this mattress over others. Of all the Sleep Number models, the I-10 is the ultimate mattress for customized comfort. The I-10 is a luxurious mattress option for the right couple. This mattress could be a great fit if someone prefers memory foam and another prefers regular foam mattresses. It also helps you both stay cool. However, there was feedback from some customers that a valley created in the center of the bed between the two air chambers – especially in the Split King – is uncomfortable for couples trying to cuddle (and difficult to change the sheets). Customers who also purchased the adjustable bed felt that the separate mattresses – especially in the Split King- tended to slide forward and bunch at the foot of the bed. Click here for our all-encompassing Sleep Number review. I purchased this bed 30 days ago. I called today to let them know I would be returning the bed as it did not work for myself or my husband. I made a phone call before I purchased the bed to make sure I could get a 100% refund if the bed did not work out as I was paying for this with cash. I spoke to the store manager in Orange Park, FL. and she stated that I would get the 100% back except for the sheet and mattress pad I bought with the bed. Today when I called to get my refund I was told that I would get less than half of what I paid as they will make me keep the base as they do not take them back. Half of the price was for the base now they are telling me this when it was the question I ask up front else I would not have bought the bed in the first place. Very unhappy with there refund policy as they are not upfront with what can be returned.Will never refer anyone to buy this product. Wow… thank you for sharing this Denise… The new master bedroom suite is almost finished and wanted to get a sleep number bed for awhile. This information is making me more wary of the product (if this is how their sales teams work). There are a lot of good mattress products out there these days… maybe I’ll look around a bit more. READ the paperwork, we knew about the return policy before we even went to the store, We purchased the i10 flexfit3 adjustable base and we love it and have looked at every mattress out there. we were on a water bed for 43 years and loved it, Sleep number is an investment in your life! We spent two hours in the store from bed to bed. I purchased a Saatva Orthopedic Mattress about a year ago and it hasn’t help me one bit. I have a Titanium Plate in my Neck at C-3,4, & 5 and currently going through L4, 5, & 6 Lower back Surgery and my Mattress isn’t helping me to sleep. I’m currently 100% totally and Permantly Disable Veteran from the US Army. I have a question, and it has to do with Service Connected Disable Veterans. Generally speaking this is a great product that can bring happiness to many people who are suffering from injuries or old age. However, there should be some asistance for the Disable to be able to afford this type of bed to get out of pain and live a good qality of life the rest of their days. It’s very simular to what a hospital bed does; Is there any grants or assistance for the Disable to help them to be able to afford this type of bed? Hi Robert, Thank you very much for your service. I don’t know of any grants that help veterans with beds specifically but I believe your local VA office should have resources and contact information on grants for financial assistance in general, which you may be able to put towards the purchase of a bed. If I hear of anything I will reply to your post again.